This is an open letter from both Teri Leavens who is the Bpeace advocate for Hervé, one of our Rwandan Race to Innovation finalists, and Hervé. Over the last 5 months, I've had the distinct pleasure of supporting and coaching an entrepreneur who makes me extremely proud to be a part of Bpeace. Hervé Debarego chose to start a food delivery service in Kigali after witnessing three women dashing through the city, attempting to escape from the police. These women typically sell fruit in the Kigali streets, bringing in needed money to provide for their families. Unfortunately, they are often forced from the city sidewalks and end up running from a police force who wish to seize their wares and destroy what fruit they carry. In addition, Hervé visited a friend's house one evening, and over dinner listened to his friend's mom's daily stress, frustration and anxiety with juggling work, family and home responsibilities. Rwandan women are struggling to provide adequately for their families and find enough time in their day to balance their mile long to do list. Hervé recognizes these challenges and hopes to provide stable employment for the women selling fruit on the streets, as well relieve women of the time and energy needed to put healthy food on the table. As the Race to Innovation continues, please vote for Hervé (Voting site: http://www.globalgiving.org/projects/herve/)and consider spreading the word of his business to those you think may be interested in his work. 100% of the money raised will provide him with needed equipment, such as freezers and a truck. Both items are absolute necessities to get his business up and running, ensuring adequate food storage and proper food delivery. He already has individuals contacting him, asking when his business will be up and running! I started to work with Teri in December last year; I admire her work attitude which is constructive and friendly. She helped me to become hard worker and to increase my communication skills. From this friendly collaboration I arrived to make a great progress on my project in spite of my busier scheduler as pharmacy student. Now Teri is not only an Advocate but also a friend of mine. Teri and another Bpeace member Marie Greener helped me so much in the organization of my market research where they contributed with technical advice on how I should conduct the research, collect and analyze my data. These techniques helped a lot to understand my customers and their behaviour on food purchasing. Teri also found me experts in food delivery from FreshDirect, City Harvest. With Teri I learned how to make a customer database, to find the right people for my business and Teri's role in the development of my project is indescribable and I continue to see it on every step of Bpeace Race to Innovation. During this Race, Bpeace gave me the ability of thinking deeply and opportunities to create jobs. 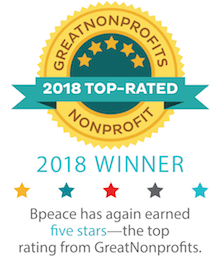 Bpeace also helped my classmates from my experience with it. Now they believe that job creation is not just the responsibility of government, old people or rich persons, but also a young graduate could make the change on lives of many families by providing jobs. I testify that this is the great impact on the development of Rwanda. Bpeace opened in me a door to success and I hope the future will enjoy today's Bpeace investment. Thanks to Bpeace, I now have a well detailed business plan. It contains guidelines and all protocols that I will follow in the implementation of my business idea. Please ask your friends to vote for me. http://www.globalgiving.org/projects/herve/ The money raised from vote will help me buy freezers and a truck for my start-up.